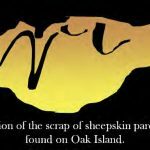 The following is a Plot Summary and Analysis of the Season 5 Finale of the History Channel’s TV series The Curse of Oak Island. 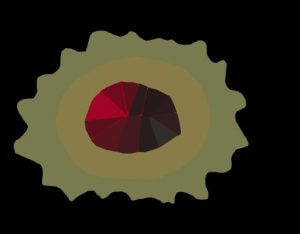 An interpretation of the brooch found on Oak Island’s Lot 8.
fashioned nature of its facets (i.e. its twelve flat, polished surfaces). “These were hand-cut,” he explains. “These weren’t machine-made, and these were done before the days when people thought about refraction and light going through the stones.” Drayton further discloses that the housing in which the gemstone was set is made of silver with a high percentage of copper- a hallmark of pre-modern silver jewelry- and that the gemologist was able to corroborate the trinket’s age by analyzing the patina formed by the copper’s oxidation. The treasure hunters agree that further analysis of the gemstone is in order before concluding the meeting. The next day, the Oak Island team congregates at the Money Pit, where diver Mike Huntley is preparing for his upcoming dive down the DMT Shaft (first discussed in Season 5, Episode 15). The narrator reminds us that Huntley’s objective is to determine the nature of the 75-foot-deep obstruction which precluded further excavation of the shaft back in Season 5, Episode 13. He also informs us that the team has already poured flocculant (a chemical which causes water-borne particles to clump together) down the shaft in the hopes of improving visibility. As soon as his preparations are complete, Mike Hunley is lowered down the DMT Shaft on a bosun’s chair. Rick Lagina, Alex Lagina, Charles Barkhouse, Gary Drayton, and Craig Tester, the latter in attendance via Skype, watch Huntley’s descent on a screen at the surface, which displays the diver’s point of view. Huntley reaches the shaft’s 75-foot depth without incident. Unfortunately, it appears that the flocculant which the team poured down the shaft not only failed to improve visibility (Huntley’s line of sight is severely impeded by clouds of sediment), but also transformed the bottom of the shaft into a spongy, impenetrable slurry. “This is definitely one of the weirder bottoms I’ve been on,” the diver remarks. “I can sink like no tomorrow, but as soon as I touch bottom, it pushes me right off.” Unable to properly investigate the obstruction, Huntley returns to the surface, packs sixty pounds of lead into his suit, and immediately heads back down the shaft. Again, Huntley reaches the shaft’s bottom without mishap. This time, with the aid of the added weight, he is able to stand on the floor of the shaft, and proceeds to examine the obstruction. Suddenly, he asks the team to call Jack Begley over. When Begley arrives at the “command centre”, where much of the team is assembled, Huntley informs him via radio that the bottom is “kind of wide, like a [steel] plate,” to Begley’s obvious delight. Craig Tester then asks Huntley to retrieve a sample of the obstruction. The diver proceeds to liberate some of the material with a knife before putting it in a bag and returning to the surface with it. Upon his ascension, Huntley learns that the samples he chipped from the shaft’s bottom failed to make into his bag. As Huntley has reached his daily “dive time safety limit”, backup diver Nick Perry, equipped with a hand-held metal detector, makes a trip to the bottom of DMT to retrieve the samples. Upon reaching the bottom, Perry begins probing the shaft’s floor with his knife and strikes something hard. When he runs his metal detector over it, however, he discovers that the obstruction appears to be non-metallic. 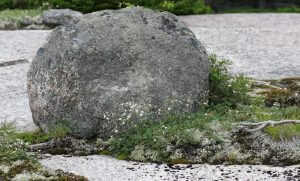 He then runs his bare hand over the material, and opines that it is probably hard granite. Nevertheless, he retrieves some of the samples Huntley left behind and returns to the surface with them. Indeed, the samples prove to be shards of granite. Dismayed, the Oak Island crew concedes that the mysterious obstruction which broke the steel teeth of their custom-made caisson is nothing more than a hard granite boulder. The following day, the Oak Island crew bids farewell to the men of Irving Equipment Ltd. and ROC Equipment, whose services will no longer be required this season. The next day, the Oak Island crew, with Craig Tester in attendance via Skype, meet in the War Room, where Charles Barkhouse has prepared a display featuring the various artifacts recovered on the island that summer. There, they discuss the implications of the discoveries and debate their next course of action. 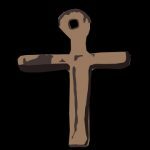 First, Gary Drayton opines that the lead cross found on Smith’s Cove is the “find of the season”, considering its close resemblance to a design carved on one of the walls of Domme prison by Templar knights. Rick Lagina and Charles Barkhouse agree that the lead cross is the artifact most worthy of further research. An interpretation of one of the fragments of human bone brought up from Drillhole H8. 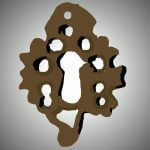 An interpretation of the scrap of sheepskin parchment brought up from inside the Chappell Vault. An interpretation of the English coin bearing the likeness of King Charles II. After that, Gary Drayton reminds the crew of the 17th Century British coins he unearthed on the island this season. 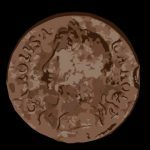 Marty Lagina suggests that these coins constitute proof that people visited Oak Island a century or more before the discovery of the Money Pit- a notion echoed by Laird Niven. Next, Rick Lagina asks Dan Blankenship’s opinion on the arrangement of artifacts on the table. “As far as I’m concerned,” the veteran treasure hunter replies, shrugging his shoulders, “everything we’ve got on the table doesn’t prove or disprove whether there’s treasure on Oak Island.” He remarks that the majority of the artifacts are surface discoveries which one might expect to find on any island in the Atlantic Northeast, and only prove that people spent time on Oak Island in the distant past. He further laments the fact that the manner in which such surface finds are made is, by nature, “time consuming and expensive.” When Marty Lagina asks the elder Blankenship whether they ought to continue the search, the old hand replies that the answer depends on how much money he and the crew are willing to spend. He then implies that the discoveries made thus far, in his opinion, are not significant enough to justify further investment in the treasure hunt. Marty responds to Dan’s bleak assessment by disclosing that, although he “entered this… quest thinking that maybe nothing of any consequence really happened on this island prior to 1790,” the artifacts recovered this season changed his mind. 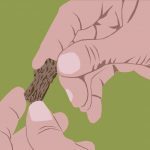 Doug Crowell nods his consent, venturing that these artifacts constitute “some of the most convincing evidence in the last 120 years.” This sentiment is echoed by Craig Tester and Alex Lagina. Most members of the crew similarly express a strong desire to continue with the treasure hunt. Finally, Rick Lagina marries Dan Blankenship’s sobering advice with the rest of the crew’s enthusiasm by suggesting that they proceed with the treasure hunt in a manner accordant with the clues they have discovered. With that, the meeting is ended. In this episode, it is revealed that the red jewel discovered on Oak Island’s Lot 8 in Season 5, Episode 16 is a rhodolite garnet, and that it- along with the copper-silver brooch in which it was set- was likely fashioned in the 16th or 17th Century A.D. Taking his cue from Marty Lagina, the author of this article has decided to attempt a little junior archaeology of his own. Specifically, he will attempt to determine the nature of this rhodolite garnet brooch by considering its design and the substances of which it is composed. 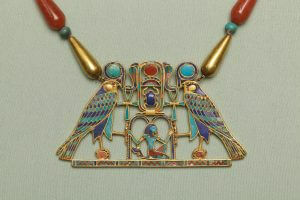 An Ancient Egyptian pectoral and necklace inlaid with red garnets. One thing to consider when attempting to determine the nature of this artifact is its centrepiece, the rhodolite garnet. Garnets are semi-precious stones which have been employed in artwork for millennia. During the Bronze Age, Ancient Egyptians set red garnets in decorative and ceremonial objects, and certain pharaohs are known to have worn them in necklaces. In Classical Antiquity, these stones adorned Ancient Greek, Roman, and Carthaginian artifacts. Roman naturalist Pliny the Elder wrote about them in his famous encyclopedia Naturalis Historia, as did Ancient Greek philosopher Theophrastus in his notes on mineralogy, collectively entitled Peri Lithon. A Saxon sword hilt decoration inlaid with red garnets. By the 4th Century A.D., red garnets were the most common gemstones in the Roman Empire. Following the 5th Century collapse of the Western half of this regime, various migratory Germanic tribes inlaid golden jewelry and other valuable objects with strips these semi precious stones. For those tribes which adhered to Christianity, red garnets symbolized the Blood of Christ. 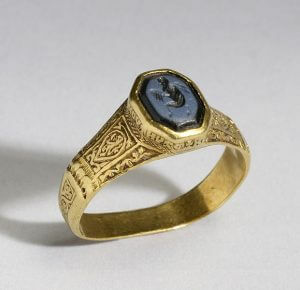 A medieval Byzantine signet ring. Well into the Middle Ages, nobles wore signet rings (which were used to impress personal crests into wax seals) made of red garnet- a practice first employed by the Ancient Romans. The word “garnet” has its origins in this time period, deriving from the Medieval Latin word “granatum“, which refers to the many garnet-like seeds of the pomegranate. 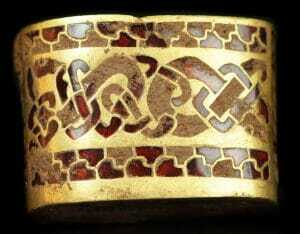 Aristocratic Europeans continued to wear decorative red garnet rings throughout the Early Modern period. Interestingly, rhodolite garnets- the specific type of garnet set into the brooch found on Oak Island’s Lot 8- are considered to have been first discovered (or, perhaps more accurately, “classified”) in the late 1890’s in North Carolina, USA, by a Rhode Island mineralogist named William Earl Hidden. These reddish-purple stones owe their name to the rhododendron, a purple flower native to North Carolina, which, in turn, owes its name to the Greek word “rhodon“, or “rose”. 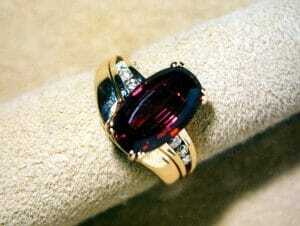 “Rhodolite” is not a scientific term, and does not denote a particular species of garnet, mineralogically speaking. Rather, it is a term used by jewelers to describe garnets of a particular reddish-purple hue. Today, rhodolite garnets are mined in the United States, Brazil, Greenland, Norway, India, Myanmar, and several countries in southeastern Africa. 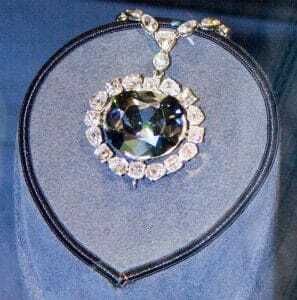 The notorious Hope Diamond, once a Crown Jewel of France, has many facets. According to an unnamed gemologist who Gary Drayton claimed to have consulted in this episode, the rhodolite garnet found on Lot 8 was crafted in the 16th or 17th Century, judging from the condition of its 12 facets (flat faces)- two to four centuries before Hidden’s official aforementioned discovery. History supports the notion that the gemstone was probably not fashioned much earlier than this. Although Persian jewelers have been cutting facets on gemstones as early as the 11th Century A.D., gems were usually polished (rather than cut) up until the late 1300’s in Europe and the Near East (China, on the other hand, has a long history of jade-cutting stretching back to the days of the ancient Shang Dynasty). After French and German lapidaries (as gem workers are known) developed advanced facet-cutting techniques in the 1380’s, jewels like rubies, sapphires, emeralds, and diamonds were meticulously fractured along lines of cleavage (natural planes similar to wood grain). Faceted jewels were further refined in the 1400’s, when grinding wheels were developed and better rock-polishing techniques were invented. It should be mentioned that garnets do not have natural lines of cleavage, and form sharp, irregular facets when fractured under stress. Because of this, it is possible that a certain amount of bruting (“sanding” with another gemstone) was involved in the creation of the rhodolite garnet found on Lot 8. Jewel cutting improved throughout the Renaissance. By the Baroque period (approx. 1600-1750), and especially throughout the second half of the 17th Century, most jewelry revolved around the beautification of gemstones (as opposed to that of the precious metalwork in which they were housed) and the implementation of floral designs- two characteristics which support the notion that the 12-faceted Oak Island garnet, as well as the flower-shaped brooch in which it was set, was crafted sometime in the mid-late 1600’s. In this episode, Marty Lagina, who has voiced some skepticism about the Oak Island legend in the past, stated that the discoveries made this season convinced him that something of significance is indeed buried on Oak Island. Doug Crowell similarly suggested that this season’s discoveries constitute “some of the most convincing evidence in the last 120 years,” comparing their importance to that of the fragment of sheepskin parchment, the Chappell Vault, the stone triangle, and the South Shore Flood Tunnel- discoveries made by the Oak Island Treasure Company in 1897. Although the author of this article neglected to mention it in the Plot Summary, Rick Lagina ventured in this episode that the lead cross found on Smith’s Cove might be a clue as to the sort of people who buried treasure on Oak Island, while the leather scrap and piece of parchment brought up from H8 might be clues as to the nature of the Oak Island treasure. 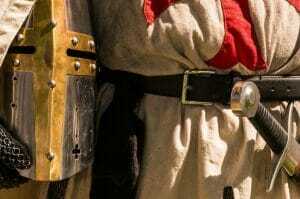 In the context of the show’s repeated attempts to connect the lead cross with the Knights Templar, the implication of Rick’s statement is Templar knights might have buried historically-significant documents on Oak Island. 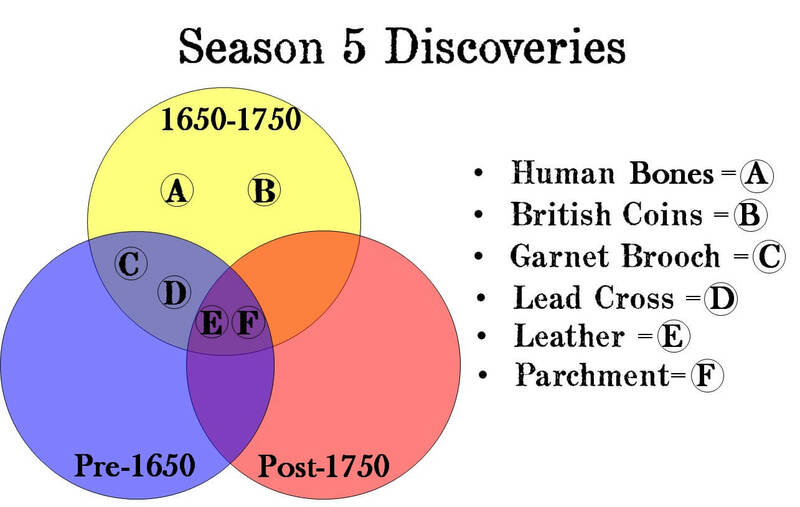 The fragments of human bones brought up from H8 which, in Season 5, Episode 8, were carbon dated from 1682-1736, and 1678-1764, respectively. The British coins discovered in Season 5, Episode 3, which bore the dates 1673 and 1694, respectively. The rhodolite garnet brooch, which an unnamed gemologist believed was crafted sometime in the 16th or 17th Century. The piece of leather, the scrap of parchment, and the lead cross are similarly consistent with this theory, although it is also very possible that they predate the suggested timeframe. I am so impressed with your writing that I bought your book. 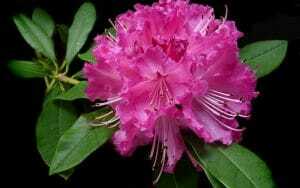 Have there been any scholarly publications on the artifacts? Thanks so much for your patronage, John! I hope you enjoy the book. I’m not aware of any scholarly papers on the artifacts. My son and I are so inambered in this program. When will the program begin again in 2018. I am 81 years old and watching this program makes my day. Thank you. Jim Morgan. 360-807-4455, jnanmorgan@yahoo.com. Hi Jim, thanks for the question. I just sent you an email. Judging from the last four seasons, I’d bet that Season 6 will probably start in November 2018.